Shih Tzu (simplified Chinese: ??? ; traditional Chinese: ??? ; pinyin: Sh?zi G?u; Wade–Giles: Shih-tzu Kou; literally "Lion Dog"), is the Chinese name rendered according to the Wade-Giles system of romanization in use when the breed was first introduced in America; the Chinese pronunciation is approximately shirr-ts?. The name translates as Lion Dog, so named because the dog was bred to resemble "the lion as depicted in traditional oriental art," such as the Chinese guardian lions. The Shih Tzu is also often known as the "Xi Shi quan" (??? ), based on the name of Xi Shi, regarded as one of the most beautiful woman of ancient China, and, less often, the Chrysanthemum Dog, a nickname coined in England in the 1930s. The dog may also be called the Tibetan Lion Dog, but whether or not the breed should be referred to as a Tibetan or Chinese breed is a source of argument, the absolute answer to which "may never be known". A small dog with a short muzzle and large deep dark eyes, with a soft long, double coat, the Shih Tzu stands no more than 26.7 cm (101?2 in.) at the withers and with an ideal weight of 4.5 to 7.3 kg (10 to 16 lbs). Drop ears are covered with long fur, and the heavily furred tail is carried curled over the back. The coat may be of any color, although a blaze of white on the forehead and tail-tip is frequently seen. The Shih Tzu is slightly longer than tall, and dogs ideally should carry themselves "with distinctly arrogant carriage." A very noticeable feature is the underbite, which is required in the breed standard. DNA analysis placed the ancestors of today's Shih Tzu breed in the group of "ancient" breeds indicating "close genetic relationship to wolves". Ludvic von Schulmuth studied the skeletal remains of dogs found in human settlements as long as ten thousand years ago. Von Schulmuth created a genealogical tree of Tibetan dogs that shows the "Gobi Desert Kitchen Midden Dog", a scavenger, evolved into the "Small Soft-Coated Drop-Eared Hunting Dog who would fight lions in packs " which evolved into the Tibetan Spaniel, Pekingese, and Japanese Chin. Another branch coming down from the "Kitchen Midden Dog" gave rise to the Papillon and Long-haired Chihuahua and yet another "Kitchen Midden Dog" branch to the Pug and Shih Tzu. The Shih Tzu was almost completely wiped out during the Chinese Revolution. Seven males and seven females were saved, and today, all shih tzus can be traced back to one of these dogs. There are various theories of the origins of today's breed. Theories relate that it stemmed from a cross between Pekingese and a Tibetan dog called the Lhasa Apso; that the Chinese court received a pair as a gift during the Tang Dynasty (618–907 AD); and that they were introduced from Tibet to China in the mid-18th century (Qing Dynasty. Dogs during that time were selectively bred and seen in Chinese paintings. The first dogs of the breed were imported into Europe (England and Norway) in 1930, and were classified by the Kennel Club as "Apsos". The first European standard for the breed was written in England in 1935 by the Shih Tzu Club, and the dogs were recategorised as Shih Tzu. The breed spread throughout Europe, and was brought to the United States after World War II, when returning members of the US military brought back dogs from Europe. The Shih Tzu was recognised by the American Kennel Club in 1969 in the Toy Group. The breed is now recognised by all of the major kennel clubs in the English-speaking world. It is also recognised by the Fédération Cynologique Internationale for international competition in Companion and Toy Dog Group, Section 5, Tibetan breeds. A number of health issues, some of them hereditary, have been found in individual Shih Tzu, and are listed below. There is no data on the percentage of dogs with these ailments. Some health issues in the breed are portosystemic shunt of the liver and hip dysplasia in standard sizes. Shih Tzu can also have brain problems, such as cancer, that they are born with. This often shortens the life span. There have been cases of Shih Tzu being epileptic, in turn this also shortens the life span. 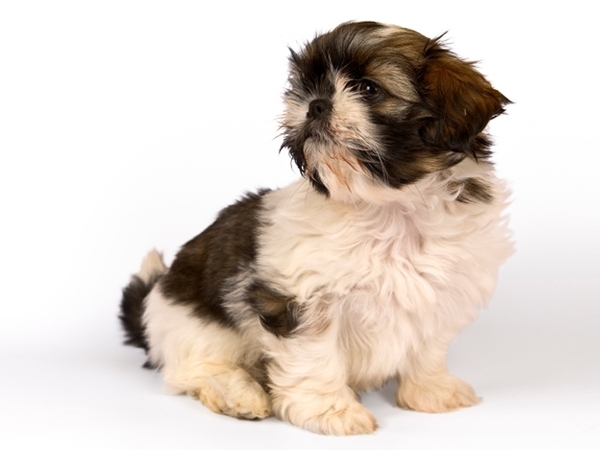 Shih Tzu are brachycephalic (short-muzzled) dogs and are very sensitive to high temperatures. Many airlines that ship dogs will not accept them as checked baggage. UK Kennel Club survey puts the average life span of a Shih Tzu at 13 years 2 months with most living between 6 and 16 years. A liver and white Shih Tzu with a liver-colored nose, which is rare. The Shih Tzu comes in a range of colors that include various shades of gold, white and red. Other colors include black mask gold, solid red, black and white, solid black, solid liver, liver and white, blue and white, brindle and white and silver and white. Though not as common there are also solid blue Shih Tzu. An interesting point (and often a point of confusion) is that while the coat color of those with black pigmented skin (nose, lips, pads, also referred to as "leather") is determined by the color of the coat itself; the coat color on dogs with either liver or blue pigment is categorized by the colour of the pigment. Thus a parti colored (white and another shade) Shih Tzu with blue pigment is a "blue and white" regardless of the tint of the hair which might very well appear similar to a gold and white or other colors. The same principle applies to solid blue, liver and liver and white.